Unusual developments at the Connecticut, New York and Washington Boards were summarized for the Annual Meeting audience by David Guay (CT), Mary Beth Nelligan?Goodman (NY) and Richard C. Sweeney (WA). Ms. Nelligan?Goodman, NY Board staff member, reported that since July 2009 the New York Board has been implementing the state’s new accountancy law, which was last changed 60 years ago. Ms. Nelligan–Goodman explained that significantly the new law “…redefines ‘public practice.’ It says if you are a CPA in New York, then you are regulated by the State Board.” It also mandates peer review as of January 2012. The new law contains language mirroring that of the Public Company Accounting Oversight Board to permit the Board to act on settlement agreements with federal agencies where the party “neither admits nor denies” guilt. The Board may now act on a referral without going through an entire investigation. The Washington State Board of Accountancy’s 24 months of litigation involving compliance with the state’s public records act were summarized by the Washington Board’s Executive Director Sweeney. To satisfy one request under the act, the Board produced 40,000 copies. “If you miss one piece of information, then you have to pay all the plaintiff’s attorney’s fees,” he stated. “The attorneys are shifting the cost of legal discovery to the taxpayers of Washington,” he observed. Making a business decision based on how high potential costs might be, the Washington Board settled with the plaintiff for $500,000. Within four days of that settlement, the Board received another public records request. Mr. Sweeney warned the Annual Meeting attendees that Boards need a responsibly designed records retention schedule and a digitized electronic retrieval system to meet their public disclosure responsibilities. 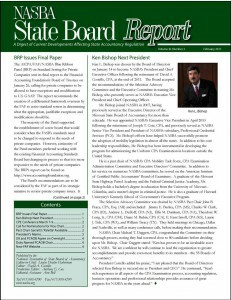 His detailed report to the Boards can be found on www.nasba.org in the meetings documents section.